I dont have any experience with 35mm film cameras. I own Canon 5D MII full frame camera. I wonder what full frame camera lens would be equivalent to Hitchcock's favorite 50mm movie camera lens. If I am right, it would be something around 70-80mm on full frame sensor. I am a bit confused, because Hitchcock used the 50mm lens because it mimicks normal human vision. But if its equavalent on a full frame camera is around 70-80mm, it doesnt mimick human vision at all. Its more like a portrait lens. Spielberg's favorite lens is 21mm. Lets say I want to mimick this focal length on my full frame Canon 5D camera. What lens should i use? 73mm and 75mm, which is hardly close to human vision. Perhaps a 35mm lens was used. Did Hitchcock really shot the whole Psycho with 50mm? Conversion factor is about 1.5X, close enough. I had heard that Spielberg's favorite lens was a 27mm, not a 21mm. Spielberg's favorite lens is 21mm.﻿ Lets say I want to mimick this focal length on my full frame Canon 5D camera. What lens should i use? In a FF camera, a 50mm is a... 50mm, you don't have crop factor with FF. Get a 50mm and start shooting. It's curious that Hitchcock often mentioned 50mm as having a "natural" perspective that "gives you what your eye sees", but he shot on various formats including silent aperture, Academy and VistaVision, where a 50mm would give different angles of view. It's possible he felt that looking through a viewfinder the magnification of a 50mm seemed to match what his other eye saw, but of course that depends on the magnification of the viewfinder optics too. Most likely I think he was talking about the distortion or sense of depth, as in how a long lens can flatten perspective while a wide angle lens stretches things out and makes spaces seem larger than they are. But again whether a lens is deemed long or wide is a function of the format size, and the distance then determines the perspective. The question of what focal length/format combination (or field of view) mimics human vision is a tricky business. Peripheral vision extends out to about 140 degrees, which you can test by holding your arms out to the sides and while wiggling your fingers bringing your arms slowly forward until you notice the wiggling movement. But our area of sharp focus is only about 10 degrees or less. So where between those extremes do you choose an angle that seems "natural"? ...Perhaps Hitchcock did his VistaVision period mostly on a 50mm so when he did "Psycho" he used the equivalent to a 50mm view, i.e. closer to a 35mm, but was used to saying he used a 50mm after five years of shooting VistaVision? According to this the standard lens for 35mm is 50mm. When you say "diagonal" though you have to remember that 4-perf Super-35 full aperture was only used in the Silent Era, and today Super-35 is cropped to 1.78, 1.85, or 2.40 so the diagonal is shorter. 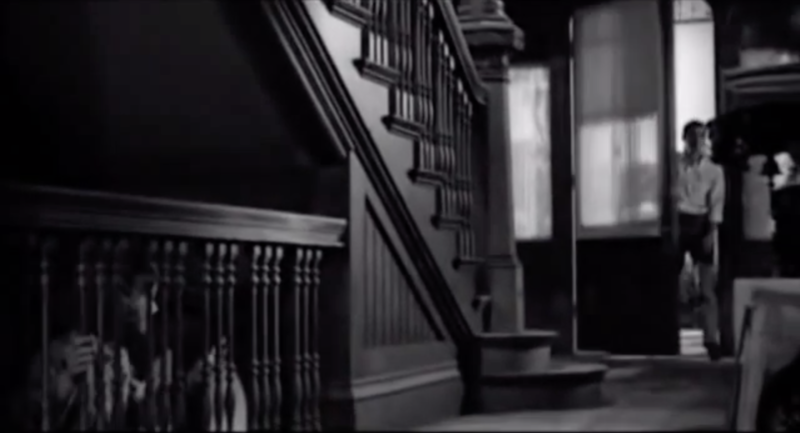 And Hitchcock shot "Psycho" in 4-perf 35mm Academy, not Super-35, cropped to 1.85, so even a shorter diagonal. Anyway, the tradition has always been a 50mm for FF35 as being "normal". From Wikipedia: "For still photography, a lens with a focal length about equal to the diagonal size of the film or sensor format is considered to be a normal lens" / "For a 35mm camera with a diagonal of 43 mm, the most commonly used normal lens is 50 mm, but focal lengths between about 40 and 58 mm are also considered normal. The 50 mm focal length was chosen by Oskar Barnack, the creator of the Leica camera." Also the wider the aspect ratio, the shorter the view vertically is compared to horizontally so often there is a tendency to split the difference in terms of what would be considered a normal view and go with something a bit wider in view horizontally to compensate for the reduction in view vertically. Hence why the 50mm in 4-perf 35mm Academy felt like it saw "more" of a view compared to a 50mm when cropped vertically to 1.85. The ideal optimum viewing distance is affected by the horizontal angle of the camera capturing the image. One concept of an ideal optimal viewing distance places the viewer where the horizontal angle subtended by the screen is the same as the horizontal angle captured by the camera. If this is the case, the angular relationships perceived by the viewer would be identical to those recorded by the camera. A mismatch in this regard is traditionally disregarded, but some rotating motions can make these distortions very noticeable as a pincushion effect. This is likely in 3d video games, so gamers are likely to adopt close viewing positions matched to a game's fixed field of view. If the camera's angle were always the same, an optimal viewing distance could be easily calculated. However the camera's horizontal angle varies as the focal length of its lens changes. If the camera's sensor has fixed dimensions, a shorter focal length (wide angle) lens captures a wider angle of view, requiring the viewer to sit closer to the screen. Conversely, a longer focal length (telephoto) lens captures a narrower angle of view, demanding a more distant viewer position. Such opposing viewing distances would not only be impractical, but would negate the very purposes of telephoto shots (for example, to see a distant object in more detail, or minimize distortion in facial images) and wide-angle shots (causing the viewer to sit too close to the screen, where undesirable image artifacts would be visible). One compromise assumes the lens is "standard" (a 50mm focal length, for a standard 35mm format). A "standard" lens preserves the same spatial relationships perceived by a spectator at the camera location. For a "standard" lens image, viewing distance should be equal to the diagonal length of the screen. It has been demonstrated that viewing a display that occupies a greater visual angle (also referred to as field-of-view) increases the feeling of presence. More importantly, the wider the visual angle (to approximately a plateau point of 80 degrees), the greater the feeling of presence. Horizontal, vertical and diagonal field of view.